Travelling around the city to the Artists Open Houses couldn’t be easier with the m-ticket app. For just £4.90 a day you can have unlimited travel on any Brighton & Hove Bus, including night buses. Tickets are available 24/7 and can be purchased to travel immediately or saved until later. Simply buy and activate your ticket, show the driver and away you go. Download the app from Google Play or Apple App Store now. The system uses SoBi smartbikes, which are available for hire in central Brighton & Hove stretching along Lewes Road towards Brighton University and the University of Sussex. For any enquiries about using the scheme please contact [email protected] or call 01273 978096. 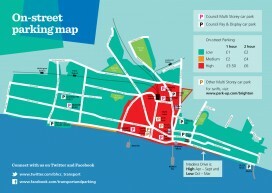 Brighton & Hove City Council operates several off-street car parks and numerous on-street pay & display parking spaces across the city. Most on street parking is now pay by phone. You will need to register first at https://paybyphone.co.uk/ registration or call 01273 458458 to do this. Once registered you can pay using touch-tone or text, following the instructions on the meter. You do not need a smart phone for these methods. Although Brighton & Hove City Council has reduced the number of on street cash pay and display machines, there is usually one per street.